Dyna-Ski Boats: Dyna-Ski Outboard compared to other outboards boats. Dyna-Ski Outboard compared to other outboards boats. I'm used to people comparing Dyna-Ski Boats to Inboard water ski boats but never really stopped to think that they might also be comparing Dyna-Ski Boats with boats made by other outboard boat manufacturers for water ski use. Well after a nice phone call from a potential buyer of a 17.6 Open Bow the other day I decided it was time to rethink some things and write this piece. There are some nice Fish & Ski Boats being made. I have always thought that you can fish with almost any boat and I guess that you could ski behind most any boat as long as it has enough power but would you want to? If you ski more than once a year it is nice to have certain things that skiers and drivers take for granted on a water ski boat. We can add anything that you want to a Dyna-Ski boat if you want to fish some. There are some pontoons made that the manufacturer's suggest make good ski boats in addition to being a party boat. They are rated for a big enough engine but usually draw a lot of water taking off. They turn sharp enough at speed to throw everyone around and spill drinks. I know that trying to teach a person to ski or pick up a fallen skier with my own pontoon boat would be difficult as the docking of the boat is difficult enough some times so having a skier in the water to deal with would be difficult also. Once a person is up skiing or tubing it might be fine. I wonder how the wake is and if they hold speed very well? Going the proper speed (often slow) with good control is important with skiers young and old, big and small. We do fish a couple times a year from my pontoon boat. It has seats mounted up front for fishing. It is hard to keep anchored in one place if it is windy though. Dyna-Ski Boats are purpose built for water skiing. Our boats are designed to ride with the bow (front) of the boat close enough to the water so the driver can see where they are going at all speeds. When you turn a Dyna-Ski around to pickup a fallen skier you will experience that the bow of the boat will be high enough most of the time so the driver and passengers stay dry. 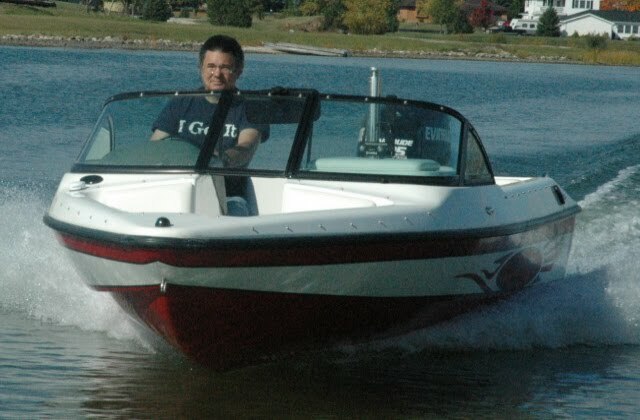 Dyna-Ski Boats handle and perform very well like a sports car on water. We make a boat that is very good for all types of water skiing. It is not purpose built for any one aspect of the water sport. The tracking fin gives Dyna-Ski Boats stability I doubt you will find in a boat without a fin. Dyna-Ski Boats powered by a single motor have a nice wake for all types of skiing. You can make a bigger wake for wake boarding by adding weight (fat sacs) just like the inboards. If you add weight to any boat the bow of the boat may ride higher which is often necessary to make bigger wakes. A two or three motor boat does not need fat sacs to make bigger wakes just tilt the engines up. As a bonus an outboard motor can be trimmed or tilted up for operating in shallow water while docking, loading, etc. As long as you have enough water for the outboard motor to operate it means you should not have a problem with the tracking fin either. An outboard powered water ski boat is easier to dock than an inboard water ski boat and most inboard/outboard boats. Deck boats are interesting. I've noticed they are expensive but then what boat isn't? The deck boats I have checked all seem to be very big and heavy. Sort of like a pontoon with a fishing boat hull. Hydrodyne made deck boats many years ago. Long before their time perhaps? I have a 24' Hydrodyne Outboard Deck boat. I bought it cheap many years ago and keep telling myself that I should rig it up and try it. Maybe next summer perhaps? Hydrodyne made a lot of interesting boats over the years including house boats, a paddle wheeler, a fire department boat and inboards for several years. I guess they never made much money or they might still be around perhaps? Dyna-Ski Boats have a nice small well define wake for slalom skiing. Women and kids love the small wake. Barefooter water skiers like the speed available. The propeller on the motor, motor height and trim all affect the barefoot wake. Most footers like a rope slight longer than 75' behind any outboards being used for barefoot water skiing. Fiberglass boats tend to ride a lot nicer than aluminum boats. Our Dyna-Ski Outboards ride pretty well in rough water. Much better than many inboard water ski boats I've been in. If you are having a tough time deciding what to buy you really should try a boat before you buy a boat. Try it the way you will use it when possible. Remember that buying a new boat is less of a risk than a used boat as a new boat will run well and has a warranty. A used boat usually does not. Truly buyer beware when it comes to buying used! Since we have built a stock 20' Dyna-Ski Closed Bow Boat that has three 300 horsepower engines for the Badgerland Water Ski Club I'm sure we can build a boat that will last forever for the average recreational boater. What do you think?